(CelebrityAccess MediaWire) — The new open-air stage at Lake Martin Amphitheater in Alabama is attracting big shows this summer. Already on the schedule are appearances by Jett Williams and Bobby Vee, as well as the Alabama Symphony Orchestra. 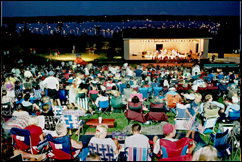 CEO Brian Russell had the amphitheater built in 1998, after deciding on an outdoor venue that would also give visitors a view of Lake Martin. Over the past couple years, the development company, Russell Lands, has renovated what used to be a dome-shaped shed because it was suitable for many of the professional groups that wanted to play there. "People would not be able to set up in the rain," Russell told the Montgomery Advertiser. "Even though we had a roof over the stage, blowing rains were a problem." The new stage has made a positive impression on performers. "I think the new stage is nothing short of incredible," Tommy Tucker, road manager and bass player for Vince Vance and the Valiants, told the paper. Rucker and the band performed at the facility in May 2004. "The think i liked most about that stage, other than it being outdoors, it was very user friendly," Tucker continued. "It was very easy to load onto, and get equipment onto." The new stage lies at the bottom of a grassy knoll that seats up to 6,000 people who can bring blankets and lawn chairs. When the 40-by-60-foot stage is not in use, it can be moved completely out of site viz a 100-yard rail system, providing a clear view of the "incredible vista" of Lake Martin, Russell told the paper. "What (the new stage) allows us to do is to attract well-known artists and well-known bands," Dave Commander, Russell Lands' VP of Marketing told the Advertiser. He said the effect of the new enclosed state – with state of the art lighting, soundboards, orchestra pit and air-conditioned dressing rooms – has been a huge factor for the facility.